Nothing says summer like the smell of grilling meat. There are a few things a griller loves more than grilled food, though. But what do you buy for the grill master who has everything? Here are some unique gift ideas to make shopping easier. 360 Degree Clean Grill Brush – Cleaning a grill can be a hassle, but the unique 3-in-1 design of this brush makes scrubbing even the filthiest grill a breeze. The bristles are made from stainless steel, and the 18-inch handle accommodates both hands, while keeping them back from the heat. It is safe to use on all grill types, and a must for any master griller. Monogrammed Personalized Grilling Apron – This is more than just an apron. Colored blue and black, it has numerous pockets to hold every utensil a master griller needs, as well as an insulated pocket for their beverage. It also includes an oven mitt, a towel for any mishaps, and a detachable bottle opener. And it looks sharp, too. Beer Jelly Set – What do you get when you mix beer and preserves? A delicious treat that can be used to glaze meat, or as an ingredient in salad dressings, baking, or even for a peanut butter and jelly sandwich that is not meant for adults only. Grill-Right Bluetooth BBQ Thermometer – For the techies manning the grill, this high-end thermometer connects to your smartphone through a handy app. Use either device to choose the meat being prepared or what level of doneness preferred. The thermometer has a color-changing display to show when it’s completed, but the chef will also be notified via smartphone. The app also saves your previous settings for future use. Meat Handling and Shredding Claws – This versatile tool is not just great for grilling, but for inside use as well. Whether turning meat on the barbecue, shredding a roast, or even mixing a salad, this is the set to use. This pair of “bear claws” is heat-resistant and designed to fit the hands perfectly. And they are claws. Whether cooking salmon, steak, or vegetables, these cedar planks offer the fragrant smoky flavor that will enhance any meal. These planks come in packs of eight, and can be used up to three times each. Just soak in water, cook your meal, and even serve it to guests on the appealing cedar plank. Golfers BBQ Set – This three-piece set includes a fork, spatula, and tongs. The first two have heads that resemble golf clubs, and all three have insulated handles in the shape of golf club grips. Made from stainless steel, this set will be on any golf-loving chef’s wish list. Revolutionary 932 Degree Extreme Heat Resistant Gloves – Safety first when dealing with open flames, which is why gloves made of a combination of Nomex and Kevlar are a must for any chef. They protect in heat up to 932 degrees Fahrenheit, but despite their thickness, they still offer a light-weight versatility needed to flip and turn like a pro. Monogrammed Forged Steak Brand – These iron brands are hand-forged mimics of cattle brands used on ranches for centuries, and offer a unique personal touch for any grill master. Any guest will be amazed by the monogrammed meal brought to their plate. BBQ Grill Light and Fan – It’s nearly impossible to barbecue at night, which is why any chef would love owning this light and fan combo. The LED lights keep your meat in sight, while the dual fans pull smoke away from the grill, and out of the griller’s face. Salts of the World Test Tube Set – The average table salt has a variety of siblings from all over the world. With new flavors, colors, and textures, you’ll bring your meals to a whole new level of deliciousness. And when the salt runs out, the test tubes can be used as stylish vases, or for a whole new array of spices. Quesadilla Grill Basket – Barbecues are not just for burgers anymore. This stainless steel basket offers perfect quesadillas, and the handle keeps your ingredients inside during flipping, where they belong. Chefmaster Smokeless Indoor Stovetop Barbecue Grill – Rain or cold no longer means no barbecuing. This indoor grill works on any standard stovetop. It has an outer ring that keeps any dripping from messing up the stove, while eliminating splattering. Two-in-One Vertical Chicken Roaster – A perfectly roasted chicken is magic, so why not have two? Not only do the vented cones keep your chickens standing at attention, but they hold beer, wine, or any other liquid of your choice, to keep the chicken moist, which will have any guest begging for seconds. Kono BBQ Grill Mat – This heavy-duty non-stick mat is perfect for grilling even the smallest cuts of meat or vegetables, while still leaving the grill marks every chef wants to see. These heat-resistant mats can be used 1000 times on each side, and should last even an every day griller at least a few years. Stainless Steel Branch Skewers – Each skewer in this set has 9 individual prongs, made of laser-cut stainless steel. The handle remains cool while the meat and vegetable cook perfectly. And there is no more struggling to turn individual pieces. 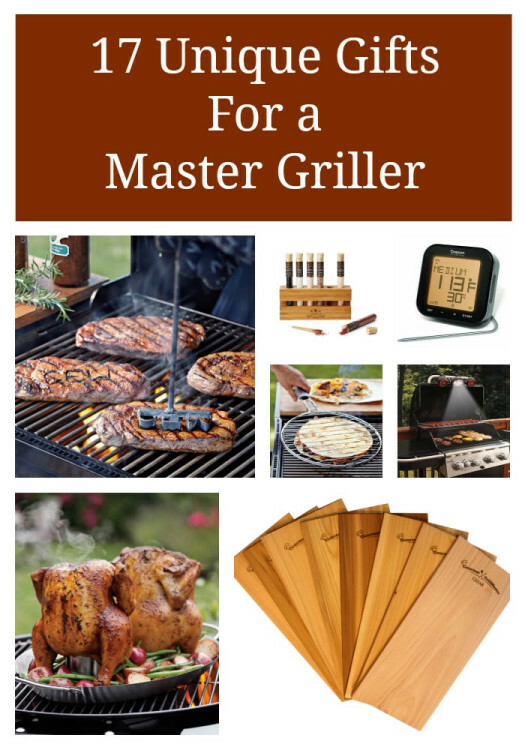 Grill Master Man Crate – When all else fails, buy the grill master a crate of goodies that will delight them. This crate includes a smoker box, wood chips, a tenderizer, 4 thermometers, as well as barbecue sauce and spices. It even comes with a laser-etched crowbar. Grilling season comes and goes, but a master is forever. Make sure your grill master has all that’s needed to show off his or her skills, and the meals served will be all the reward you need.